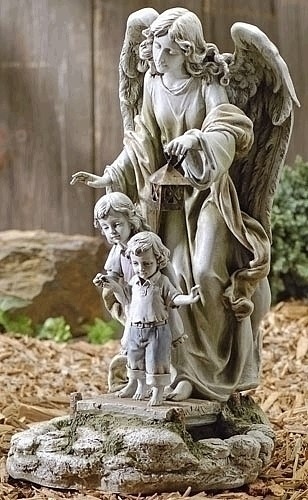 They say there is always an angel guiding each one of us and this inspiring sculpture for the garden surely adds a divine feeling as it highlights a beautiful angel guiding two children back home. Crafted of resin and stone aggregates, this sculpture is also designed as a solar statue. Hand crafted and finished. Dimensions: 20"H x 11.5" x 11.5"